Cormac McCarthy writes books that pull back the drapes to look full well upon the human condition. That is, the human condition unredeemed. I think he does it for a purpose, because his main characters always seem ripe for redemption. At least, they are searching for it. They are usually “good” people, surrounded by evil, who are looking for a way out. 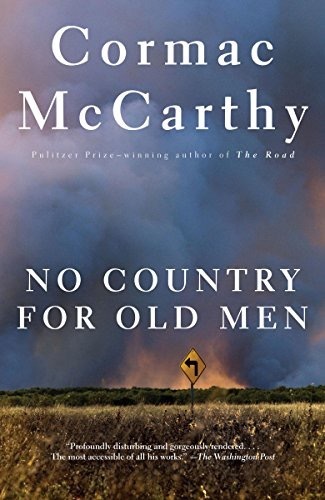 In No Country for Old Men, an especially hard novel to read for its unfettered violence, a county sheriff in rural Texas during the early 1980s is confronted by an evil that he has never before witnessed in his lifetime, and never heard about from others before him. It is an evil in the form of a single relentless killer without remorse or inhibition, driven by a logic all his own, leaving human lives destroyed in his wake. If what Sheriff Bell says is true, and I think it is, then what does that say about our society? We often hear some people say that things aren’t getting worse in our country as time goes by. They’re actually getting better. The violent crime rates are down, they say. Maybe that’s true. But the crimes that are committed seem to be getting ever more vicious over time. And that has little to do with the weapons being used, and everything to do with those who are using them. One indication of the true state of things is the number of laws that govern us today, as opposed to twenty, thirty, or fifty years ago. We have more laws than ever before, restricting our freedoms and telling us how we must behave. If it takes very little to govern good people, and yet we need more and more laws to govern our society, then what does that say about us? Are we becoming a bad people, ungovernable even by the many laws already imposed upon us? Why are so many more laws necessary today? Our founders believed firmly that people could govern themselves, but only if they remained a moral people. As John Adams put it, “Our Constitution was made only for a moral and religious people. It is wholly inadequate to the government of any other.” Was he right? Perhaps we are soon to find out. Fewer and fewer people attend religious services of any kind on a regular basis these days. The name of God and the person of Christ are despised and mocked more and more, rather than revered as they once were in this country. Our marriages and families are falling apart. Folks don’t even bother to learn their neighbors’ names, much less who they are. Our people have less and less respect for authority. Our leaders aren’t trustworthy, because our people don’t care enough to hold them accountable for their lies and deceit. Nothing like the “old times.” This is a true state of affairs, isn’t it? At least, ninety percent of the time now, it would seem. Time for redemption, before America becomes no country for old men, or anyone else who might care about human decency.